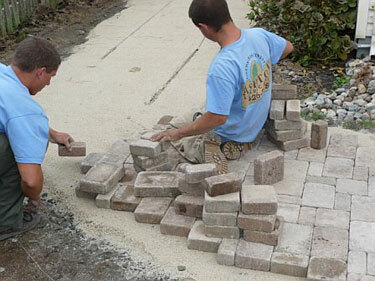 After the proper prep work has been completed, Ashton Landscaping's Crew begins to individually place each paver. Another view of a paver walkway being installed. The finished edge of this patiio created with pavers is completed. Proper bed preparation and installation is needed to ensure the quality of your plants. Perhaps the biggest mistake homeowners make is a piecemeal approach to landscaping. Homeowners begin projects, start to clear areas, put in a mix of plants, and proceed without a plan. The result is a hodgepodge of plantings and gardens that give the property a disorganized feel. An implemented professional landscape design provides a polished look. Following a professionally prepared plan will lead the homeowner to a beautiful property while remaining within a pre-established budget.